Preliminary design plan for a battle cruiser prepared for the General Board, apparently requested as part of the Boards wide-ranging review of possible cruiser type ships that was underway at the time. As noted on the drawing, specific required design criteria, including displacement, forced the creation of a design that lacked any side armor. Accordingly, this design was left incomplete once such an unlikely combination of features had developed. No such ship was built and the battle cruisers ultimately requested for the Fiscal Year 1917 program were somewhat larger (see Photo # S-584-102). 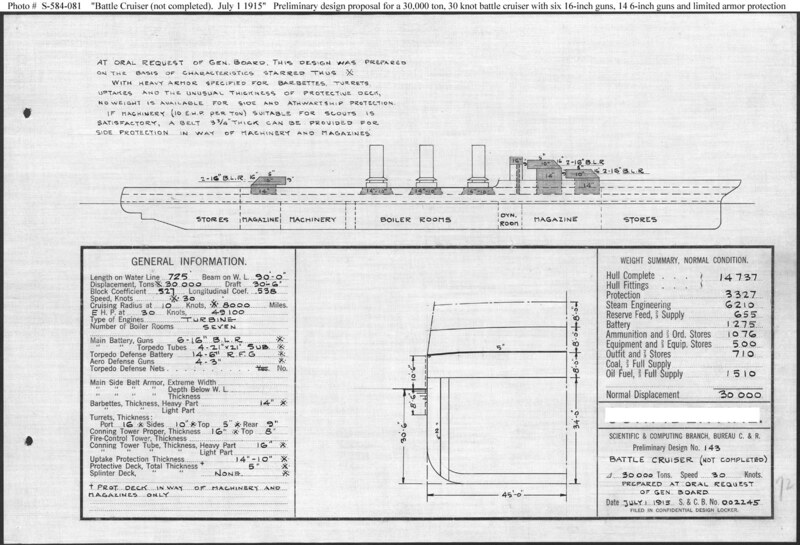 This plan provides six 16-inch and fourteen 6-inch guns, turbine machinery, and a speed of 30 knots in a ship 725 feet long on the water line, 90 feet in beam, with a normal displacement of 30,000 tons.